My 1992/98 San Antonio Trips. 1992: 10 days, 3100 miles. 1998: 10 days, 3050 miles. 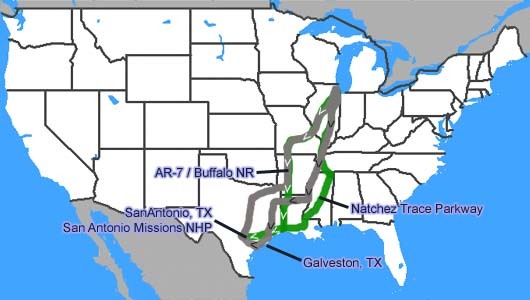 The black arrows represent my 1992 route to San Antonio, the white arrows are my 1998 route. In June of both 1992 and 1998, I was in San Antonio for the same conference for the same company. So, I'm going to combine them on the same web page. In San Antonio, the only sightseeing I did (other than walking around Riverwalk for dinner) was to the Missions. It was interesting to visit a place in America, that's older than America. Try and imagine a world without any modern convenience we know. My trip to San Antonio in 1992 was to follow the Great River Road from Southern Illinois to I-20, then over to Texas, pass by the Sam Rayburn Reservoir, down the Gulf coast and through Galveston, and then to San Antonio. In 1998, I had already determined that I was going to take the Natchez Trace Parkway back home, so I drove Arkansas Route 7 on my way there. I then took the back roads down South to the Gulf, and I-10 into San Antonio. Scenic Route 7 in Arkansas is one of my top 10 favorite roads, but they're slowly rebuilding it to modern standards and ruining one of those classic iconic country roads. sigh. Not only did I drive the road in 1992 (on the next page) but I also drove the road in Feb 1986, Sept 2002 and Sept 2005. In 1992 we were in the Marriot, in 1998 we were in the Hyatt. Mission San Antonio de Valero, aka The Alamo, nicknamed after the missions resident's home town in Mexico. If you know the place you're at is indefensible, and you stay anyway, well... But it was a must visit, it's probably one of the most recognizable landmarks in America. I respected the fact they didn't want you to take pictures in the church, but the rest of the place is fair game. Anyway, the place was finished sometime in the 1720's, but it didn't become famous until March 6, 1836. But it was probably the morale booster Sam Houston needed to defeat Santa Ana. 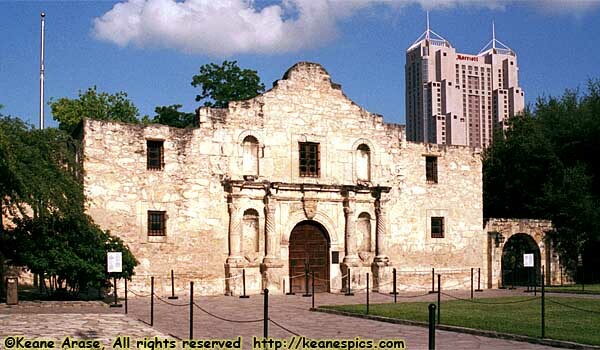 The Republic of Texas after all, was an important addition to the West. The San Antonio Missions National Historical Park is built around 4 of the 6 San Antonio Missions, built between 1718 and 1731. It's mostly original, with the necessary restorations for safety and esthetics. All four missions in the park are still used by practicing Catholics. End 1992 & 1998 San Antonio Trip - Part 1 of 2.